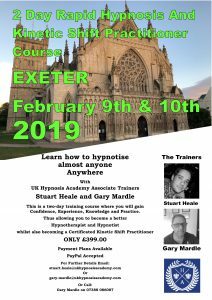 We are holding our 2 Day Rapid Hypnosis and Kinetic Shift Practitioner training in Exeter on 9th and 10th February 2019. Book Early to avoid missing out. Next StoryEXCITING TIMES AHEAD FOR CORNWALL HYPNOSIS.